Ryan Preece stepped away from a secure ride with a middle-of-the-pack NASCAR Xfinity Series team after the 2016 season to move his career forward. 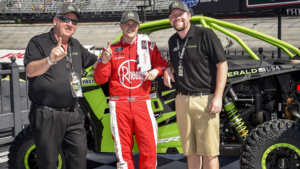 He went back to the Whelen Modified Tour and secured enough funding to land a two-race deal driving for Joe Gibbs Racing in the Xfinity Series last season. Two races have turned into seven and counting. "It was the only way I was going to get a chance and I wanted that chance and it all worked out," Preece said. "If you want it bad enough, you'll find a way." Saturday's Fitzgerald Glider Kits 300 at Bristol Motor Speedway was his third start in the No. 18 this season and carried with it a little extra motivation. Preece was one of four drivers eligible to collect the $100,000 Dash 4 Cash bonus and wasn't about to let anything, or anyone, stand between him winning it. 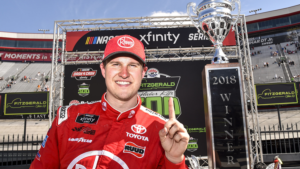 Widely regarded as one of the top short-track racers in the northeast, and highly respected in the Xfinity Series garage, Preece passed teammate Brandon Jones for the lead with 10 laps remaining and went on to win for the second time in his career in the Xfinity Series. "It's Bristol. It's The Last Great Colosseum. 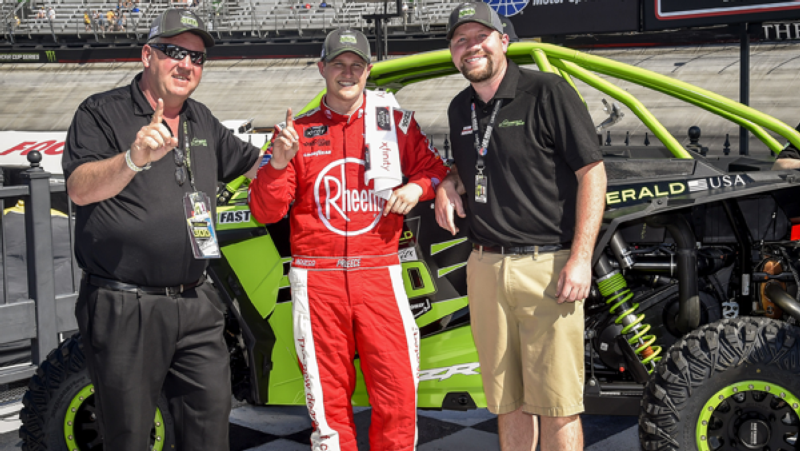 It's one of those tracks that when you grow up as a short-track racer that you want to win at," said Preece, who in 2015 won a NASCAR Whelen Modified race at Bristol. "We came here and unloaded for practice and I was really happy with the racecar. We didn't qualify where I thought we would but I knew we had a good racecar and slowly with track position and patience we got where we needed to be, the caution fell when we needed it to happen and then we had the restart we needed and Eric (Phillips, crew chief) made the adjustments there to get us out front. "As far as where this win ranks, I got a UTV. I got a sword. And a really cool trophy. So I'm going to say it's really cool. Xfinity Series veteran Justin Allgaier damaged the splitter on his No. 7 JR Motorsports Chevrolet earlier in the race and that affected his car's handling as he pursued Preece in the closing laps. He finished 0.856 of a second behind Preece in second place. "I was trying to run him down the best I could," Allgaier said. "We were just way too tight with the splitter being gone. I tried everything I could do in the car but the bottom lane at that point was just too fast. It was one of those days that we just got outrun on that last restart." Daniel Hemric, who also was eligible for the bonus, likened Preece's accomplishment as the embodiment of the American dream. Hemric finished third in the No. 21 Richard Childress Racing Chevrolet. Elliott Sadler in the No. 1 JR Motorsports Chevrolet and Spencer Gallagher in the No. 23 GMS Racing Chevrolet also finished in the top five. Jones led a race-high 106 laps and finished ninth in the No. 19 machine. A caution with 17 laps to go sent the leaders onto pit road for fresh tires after a long stretch of green-flag racing. Jones was first onto pit road and first off of it. His team opted to change left-side tires only while those behind him changed all four. "That caution right there on that long run just killed me," Jones said. "I just put my head down when I saw it because I knew we were so much better than the 18 up off the corner." Preece led 39 laps overall in a race that was slowed by 12 cautions, two shy of the series record at Bristol. When the field wasn't following the pace car, the action was textbook Bristol. It was the physical, emotional, edge of your seat product fans have come to expect. That the sun was out and the temperature hovered around 80 degrees made it an ideal day for racing. Drivers favored the bottom groove but ventured higher as needed. Traction compound applied in the bottom lane in the turns made it the preferred route. "I thought the racing today was great," Sadler said. "There was a lot of passing, a lot of action and at the end of the day isn't that what fans want to see?" He continued: "My opinion is that if it was a good race today, the fans enjoyed it, it looked to me that there was a lot of passing going on, a lot of close racing, beating and banging, and all that stuff, why wouldn't you think that was good for the sport or good for this track?" Phillips stressed a patient approach to his driver in the days leading up to the race. "This racetrack changes constantly, so it's just managing your car," Phillips said. "I knew if we were there at the end with 50 to go or a caution came out at the end that we had a shot. He did an awesome job on the restart. Our guys on pit road did an awesome job. They stepped up today when it counted." The final stage was relatively clean compared to the first two stages Saturday. A seven-car wreck marred the start of Stage 2. It started at the exit of Turn 2 when Allgaier and Jones made contact. That caused a chain reaction behind them involving five other cars. On the restart, Hemric passed Preece for the lead. The race was stopped with 143 laps complete after a three-car crash in Turns 3 and 4 that took rookie Christopher Bell out of contention for the win and the Dash 4 Cash bonus. It started when Cody Ware and Vinnie Miller made contact entering Turn 3. Their cars drifted up the track and hit the wall. Bell was running third at the time and followed Ware and Miller into the corner. When he braked, the rear end of his car fishtailed to the right, sending him into a slide. The passenger side of Bell's car hit flush with the front of Miller's car. The incident mangled both cars but neither driver was injured. "That was our worst run handling-wise," said Bell, who led 35 laps earlier in the race and finished 29th. "I thought we had a car capable of doing it and then a guy that's a couple seconds off the pace spins out in front of me." Hemric was leading with Preece in second and Jones in third. The red flag lasted for 7 minutes. Preece led the final seven laps of the stage. The opening 85-lap segment was slowed by four cautions, including a nine-car pileup and a four-car crash, but ended with the four drivers eligible for the Dash 4 Cash bonus running in the top four. Pole-winner and Dash 4 Cash-eligible driver Cole Custer relinquished the lead on the opening lap when Allgaier passed him. A few laps later, Bell hit the Turn 4 wall, causing a pile up behind him that collected eight cars. Bell's car escaped serious damage and he dropped to 31st but quickly charged through the field and completed his comeback on Lap 56 when he took the lead from Hemric. They ran in that order through the end of the segment followed by Custer and Preece. Custer started the second segment at the rear of the field after incurring a pit road speeding penalty. He finished eighth in the No. 00 Stewart-Haas Racing Ford. Preece's next scheduled Xfinity Series race for Joe Gibbs Racing isn't until July at Daytona. And because the entry deadline has passed for next week's race at Richmond, he will not be among the four drivers eligible for the next Dash 4 Cash bonus. "Yes, I may not be going to Richmond but I'm going to stay for the debrief on Monday, do all of my obligations and when I fly home Monday night or Tuesday morning, I'm going to go to work just like everybody else. I'm going to go work on race cars, which is a dream come true," Preece said. "I'm going to get my hands dirty. I'm not going to be sitting around." As for the four drivers who will be eligible for the next Dash 4 Cash bonus, NASCAR announced after the race that Hemric's car failed post-race inspection and that he would be replaced in next week's Dash 4 Cash field by Jones and the No. 19 team. Joining Jones will be Allgaier, Sadler and Gallagher. Allgaier didn't begrudge Preece for collecting the bonus Saturday despite not being a full-time driver in the series. "That kid works as hard or harder than anybody in the garage area," Allgaier said. "He's setting modifieds up. He's racing his own stuff, winning races up in the northeast and all over the country in modifieds, and has a cool opportunity to come here and do this and he's making the most of it. That goes a long way." As will the $100,000 that he won Saturday. "It feels really good," Preece said. "I don't think you can say winning $100,000 isn't good. I know what it's going to do for me with my life and I can officially say I'm going to be paid off with everything that I risked last year. This is a big day for me."